Kindergarten through Eighth Grade students attend art class once a week throughout the school year. Students experiment with all different types of media including drawing, watercolor, acrylic painting, clay, collage, and more. Classes will learn about famous artists and participate in a critical discussion of famous art and art techniques. 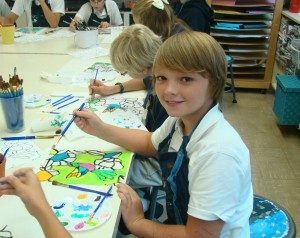 Lower School classes focus on introductions to new media and learning basic artistic skills and concepts such as shading, overlap, introduction to the color wheel, and the elements of art. Lower School students have the opportunity to work with clay and learn hand-building techniques. Each class also creates a canvas painting and a variety of other art projects throughout the year. Lower School studies famous artists such as Vincent Van Gogh, Claude Monet, Wassily Kandinsky, Pablo Picasso, Leonardo da Vinci, Giacometti, Andy Warhol, Georges Seurat, and Victor Vasarely. Each Kindergarten through Eighth Grade class participates in an immersion project for the International Festival that occurs in January. Each also designs an artwork that is displayed in the breezeway for the Festival of the Arts.